Hair Fair 2018 opens on September 22nd and E.V.E has designed special textures for one of the official bandanas with 100% of the proceeds to benefit Wigs for Kids, a nonprofit organization that has been serving children suffering from hair loss since 1981. Each year the Hair Fair collects millions of Lindens for Wigs for Kids and this year E.V.E wanted to contribute to the cause. The unisex LUXE Bandana is material enabled to produce a shiny raven scales effect and gold line embellishment. 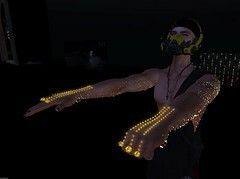 Posted in E.V.E Studio, News, Sale, Second Life, wardrobe and accessoriesTagged 2018, bandana, Bandana Day, E.V.E Studio, Hair Fair, luxe, performersBookmark the permalink.